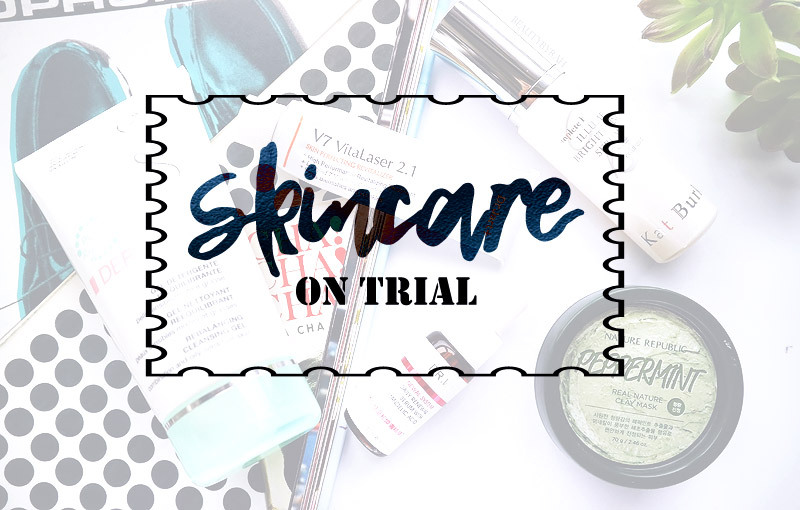 Recently, I opened some skincare products from my stash and decided to try them out. 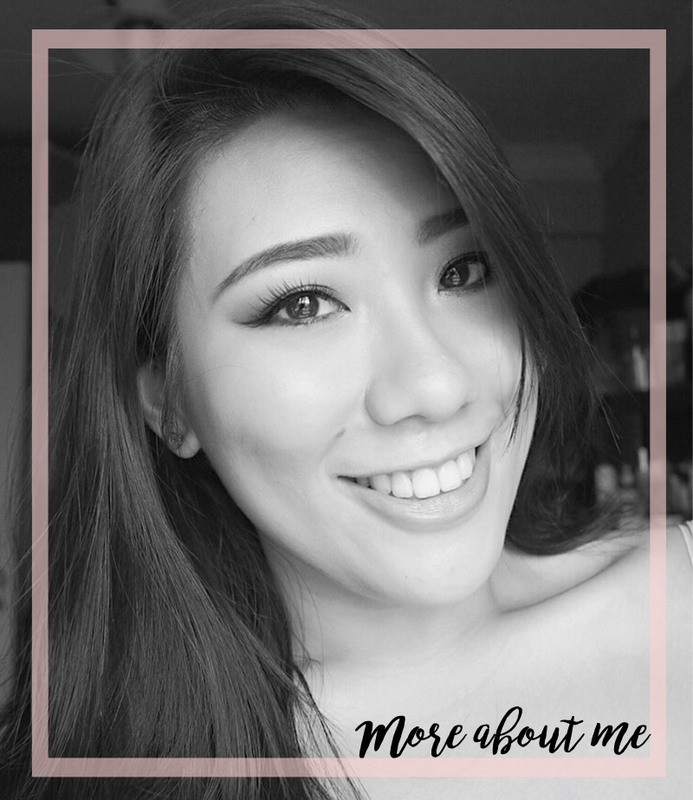 Skincare is something I am trying to put serious effort into, as who doesn't want to feel beautiful and comfortable in their own skin? Here are some bits and bobs that I've been trying out recently! This is a spot treatment that comes in an ointment texture, and I bought this a while ago to specifically target my blemishes and acne scarring on the cheeks. Needless to say, I forgot all about it and finally busted it out to use recently when I was shopping my skincare drawer for new items to try. 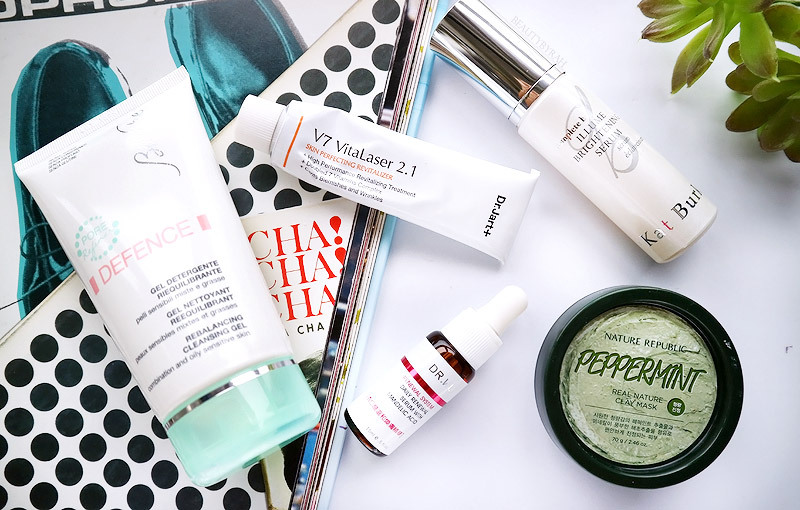 This V7 Vitalaser 2.1 is said to contain 7 vitamins (A, B3, B5, C, E, F and H) to the skin to help care for spots, blemishes, wrinkles and fine lines. Despite it having an ointment texture - a thick, opaque and extremely viscous gel, I do find that this product absorbs really easily into the skin and does not leave any tacky residue after. I use this after applying my moisturiser as according to instructions, this is supposed to be used as the last step of skin care. So far, I have been really enjoying it as I do find it that after about 2 weeks of daily usage (both morning and night), my blemishes do look less red and obvious. I will keep using it and see how it goes! I believe I got mine off Althea Korea but they don't seem to stock it up anymore. This does retail for SGD 71 at Sephora though, super pricey but I really don't remember paying so much for it! This is an extremely lightweight serum (feels just like water) that is supposed to help refine skin texture, diminish fine lines and keep skin elasticity and firmness. Chemical exfoliants are always part of my skin care as acne and skin texture are my main concerns and I find that adding one into my nightly skincare routine helps tremendously. 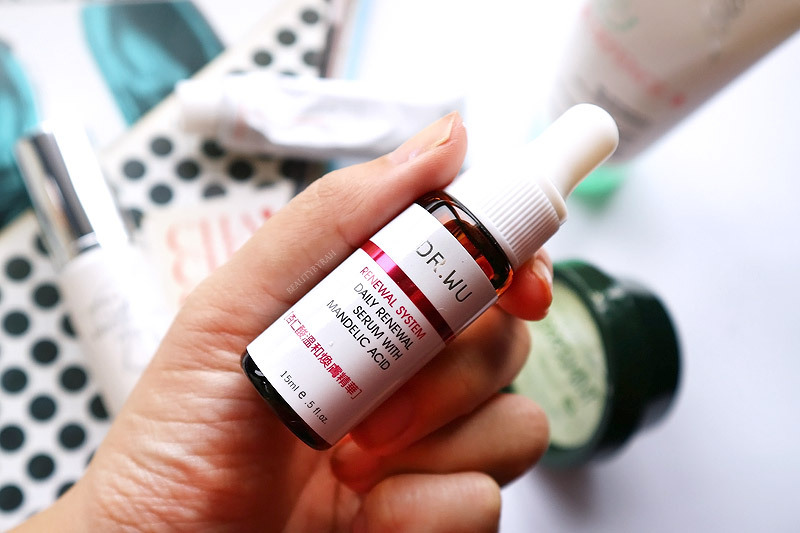 This Dr Wu serum contains 3 types of acids - Mandelic Acid, Salicylic Acid and Pyruvic Acid. The macromolecular structure of the mandelic acid is said to be closer to our skin structure than the commonly-used glycolic acid, so it is meant to penetrate deeper and get absorbed more readily. I use this before my moisturiser and I like how it absorbs right into the skin without leaving any sticky residue. Its texture reminds me of the SK-II essence, super watery and light. I do not find this sensitising to my skin at all and after using for a few nights, I could tell that my skin was smoother and a tad glowier looking. Don't forget to layer up the sunscreen though! Chemical exfoliants can make the skin more sensitive to the UV rays. I can't seem to find any website for Dr Wu Singapore though! As my skin is constantly feeling clogged, I do like to use clay masks once a week to help remove any dirt and grim that are embedded in the pores. I purchased this when I was in Seoul in March (I think it was about SGD7!) as it smelled really good in stores. 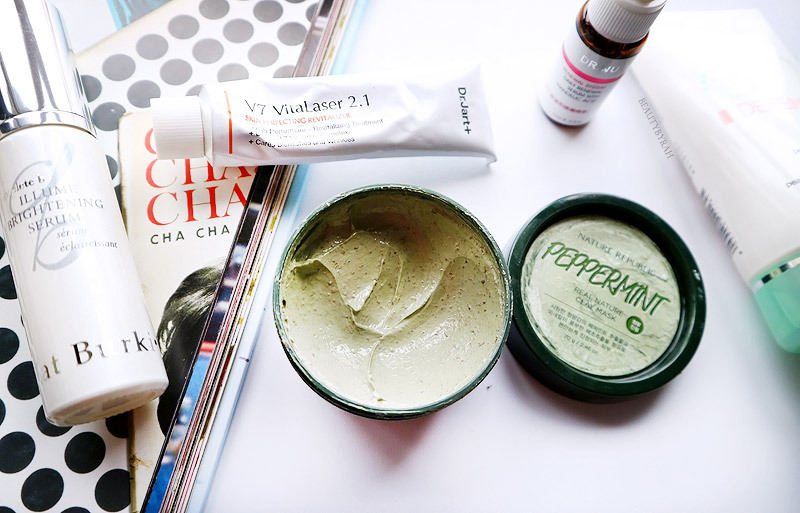 This clay mask contains peppermint to help refresh and revitalise tired skin and mineral seaweed extract makes it suitable for sensitive skin. According to the website, it contains 879ppm of Peppermint extract and 117ppm of Seaweed extract, but I have no idea what this information really entails. The descriptions were in Korean so I bought it on a whim but I'm glad I did. This clay mask does have a creamier texture than many I've tried and it goes on the skin really nicely. I did not have to tug on the skin to spread it out and I like how you can actually see bits of seaweed! After rinsing it off, my skin does not feel dry and I am liking it so far. This brightening serum claims to help photo damage and aging skin. As someone who was ignorant about sun care when I was younger, I do have quite a few sun spots that I would like to fade. This serum is said to penetrate into the dermal layer of the skin to help target the scar tissues. I am super hopeful and will update when I use this more. This has a slight flowery scent to it and feels lightweight on the skin as well. It absorbs readily into skin and I do not have to wait before applying my other skincare products. Now, this is a pricey product and definitely a part of luxury skincare if you ask me. If it really works, it may be worthy of the price point and I will keep using it and let you know! 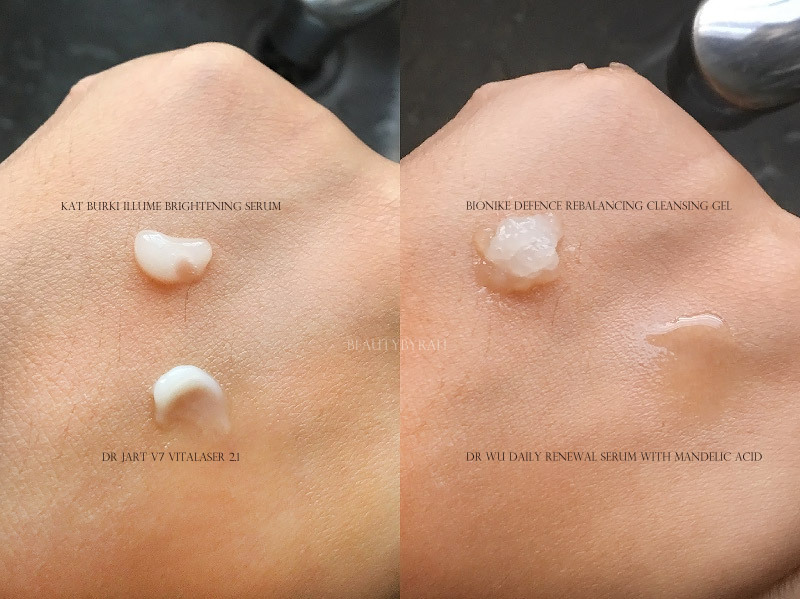 For more information on this Illume Brightening Serum, you can check it out on Kat Burki's Website here. This is a soap-free, gentle cleansing gel that is said to help in refining the pores by purifying the skin and clearing excess sebum from the pores. This has special Mediterranean resin drops to mattify and smooth the skin, as well as mint essential oil to help the skin feel fresh and clean. Meant for combination and oily skin, this is nickel-tested and free from preservatives, gluten and fragrance. I've never heard of this brand before, but was introduced to it when I was at a Watson's event last year. This cleanser does have a viscous gel texture when squeezed from the tube. I like to rub the product in between my palms before applying it to the face in circular motions. There isn't a lot of lather to it, as it is soap free. Despite so, my skin does feel clean after washing it off and it doesn't feel like a whole lot of moisture got stripped off, which is great. Remember, when your skin feels squeaky clean and tight, it really is just micro cracks on the surface of the skin! So far, I am quite liking this too. This retails for SGD 59 at Guardian and Watsons I believe. I will keep trying these out and if I really like them, I'll be sure to update this post or feature the product in my favourites for the month.